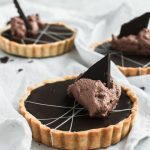 Simple Chocolate Tarts have a rich chocolate filling baked into a tender sweet crust. They’re rich and decadent, with just the perfect amount of sweetness. Preheat the oven to 350F. Place the chopped chocolate and butter in a medium mixing bowl. Heat the cream in a small saucepan until it’s simmering and steaming, then pour it over the chocolate and let it sit for 5-8 minutes. Slowly stir it together, mixing continually until the mixture is cohesive and smooth. Add in the egg, egg yolk, vanilla extract and salt, and stir until the mixture again looks smooth and glossy. It will be a bit lighter in color at this point. Place your prebaked tart shells on a baking sheet, and spoon the filling into each until it reaches the top edge. Bake for 12-15 minutes. The filling should be set around the edges, but the center should still have a wobble. Remove from the oven and allow to cool completely. Decorate as desired, and store in the refrigerator until serving. These can be made the day ahead and refrigerated overnight before serving. For the chocolate whipped cream, beat 3/4 cup whipped cream until it is thick but not peaking. Add 2 Tbsp. each of dark cocoa powder and powdered sugar. Continue beating until it forms medium peaks. Refrigerate until using.